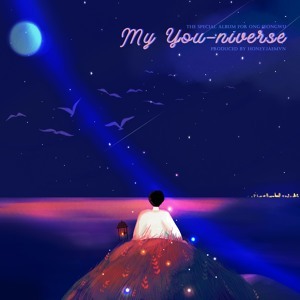 옹성우 24번째 생일 특집 앨범 'My You-niverse' The special album “My You-niverse” for ONG SEONGWU Ong SeongWu's 24th Birthday Project "Summer Triangle" Produced by HONEYJAEMVN (OSW's Vietnamese Fan Union) ================================================ 02. Happy Birthday (Special Theme) Today is ur 24th birthday I'll be staying here to sing this song that was written for you and I wish all ur dreams come true Although these words cannot say all of my feelings, I still want to tell you H-H-H-Happy birthday On this day 24 years ago when you was born as a star fell from heaven You're always a brilliant star even day or night I believed that God created you for me to love H-A-P-P-Y (Happy Birthday) B-I-R-T-H-D-A-Y (Happy Birthday) Happy Birthday ~ Happy Birthday Happy Birthday ~ Happy Birthday Mah boy~ comma hair style, flattering mouth corner... Everytime you smile, hearts flustered~ B-B-B-Bada ba boom boom Mah boy~ knows everything Popping, singing, drumming is no joke Just a little pity to be named "NO ~ JAEM JAEM JAEM~" May I sing you this song and show u my heart Just remember you'll always be, a part of me May the world treat you better and here comes my love Just be joyful because It’s your birthday May I sing you this song and show u my heart Just remember you'll always be, a part of me May the world treat you better and here comes my love. Just be joyful because It’s your birthday Did I tell you, that you’re beautiful And I love you, it’s so natural Boy, you did not know me before but that means nothing at all I just have to let you know I just have to let you know that Boy, life is full of crazy noise but it feels so much better everytime I hear your voice So... keep on singing, keep on dreaming, You’ve been working so hard I have seen you’re crying But don’t you worry, god works fairly, that’s a part of his plan You just have to do what you do, try the best that you can You have a lot more to show, you have a lot more to go, And those hard days are all gone, you’re stronger than before It’s like you’re an angel today If there is anything bad it must be you may fly away So stay with me, stay with us We’ll make you laugh and show you love And that road with flowers may it be the choice we’ll take May I sing you this song and show u my heart Just remember you'll always be, a part of me May the world treat you better and here comes my love Just be joyful because It’s your birthday May I sing you this song and show u my heart Just remember you'll always be, a part of me May the world treat you better and here comes my love Just be joyful because It’s your birthday Ong~ Ong~ Ong~ Ong~ You are the first celeb with... Ong~ Ong~ Ong~ Ong~ You are one in a million Jeongmal jeongmal jinja I just want to say that "Saranghae" Wanjeon daebak real heol just that~ "Saranghandei"